Amigo Centre, Amish, Amish cooking, Amish homemade noodles, anabaptist, faith, family, growing up Mennonite, Mennonite cooking, pigtails, ponytails, Whatever Happened to Dinner? I’m having a blast these days, preparing talks on my Mennonite heritage and cooking for two days of a Road Scholar week at Amigo Centre in September. For a number of years, Amigo Centre (my camp when I was growing up!) near Sturgis, Michigan, has organized a week of lectures, field trips and activities for anyone (well, basically retired folks, through Road Scholar, a program of Elderhostel) interested in learning more about Mennonites and Amish heritage and faith. They’ve tapped various scholars from nearby Goshen College just across the line in Indiana (and from Hesston College, Kan.) to talk about the beginnings of the Anabaptist stream of faith in 1525–an outgrowth of the Protestant Reformation in Europe–which led to Mennonites, Amish, Old Order, Church of the Brethren and Baptists (although that’s another story). In any event, Mennonites and Amish seem to fascinate some folks: witness the popularity of Amish reality shows, as low brow and distasteful as they are; Anabaptism theology is experiencing a resurgence of scholarship and study; and Amish romance novels are hot, while they’re not (not technically steamy, as Valerie Weaver-Zercher writes in The Thrill of the Chaste, reviewed here earlier). But I’m particularly excited not just because of the opportunity to lecture for a day and a half about Mennonite and Amish food traditions but because we will get to learn how to make real Amish noodles with a real Amish cook (take that, you Amish reality TV shows). 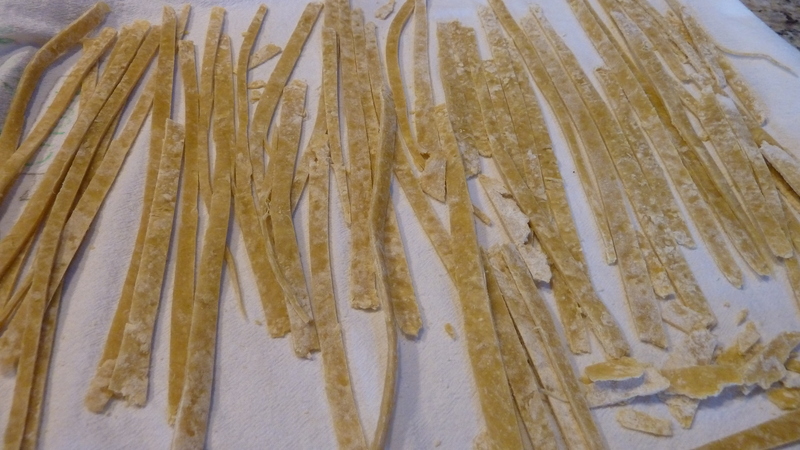 Since I wrote about my two experiments making Amish noodles here and here, I have observed that one of the more common search terms here at my blog is “homemade Amish noodles.” Who knew? My first attempt at homemade Amish noodles. I’m not sure who is more excited: me or Mandy Yoder, the Program Director at Amigo Centre who has been planning this event for close to a year. She contacted me last September after a book signing for my book, Whatever Happened to Dinner (with nearly 100 recipes) at the huge Das Dutchman Essen Haus restaurant and conference complex in Middlebury (Middlebury is where I went to elementary school). And of course one of the specialties of the house at the Essen Haus (Pennsylvania Dutch for basically “eating house,”) is Amish homemade noodles. Beef and noodles. On mashed potatoes. Yum. A special shout out to my sister Pert, a special fan of the noodles. At Das Dutchman Essen Haus Middlebury Ind., Sept. 2012, meeting faithful Another Way reader, David, age 88. Mandy and I are also working with Carol Honderich, who was in school with my sister Pert, and who I enjoyed working with at Mennonite Mission Network (based in Elkhart, Ind.—so we were long distance colleagues but got to know each other better at retreats, meetings and conferences) who is also leading a Road Scholar program that week at Amigo Centre called Amish-Mennonite Sampler Quilt: A Quilter’s Legacy in Blocks. Carol leads Amigo Centre’s annual Spiritual Quilt Retreat and offers private instruction for individuals, quilt retreats, and presentations for groups and has a quilting specialty website called Patterns of Faith. We’ll be teaming up for a Thursday night special evening that week talking about our own experiences “Growing up Mennonite: Pigtails and Ponytails,” with participants working on a comforter together to give to relief—to needy persons. We thought that was a good way for the Road Scholar participants to truly experience a little of the Mennonite ethos—to help make a beautiful quilt/comforter to share with someone else. 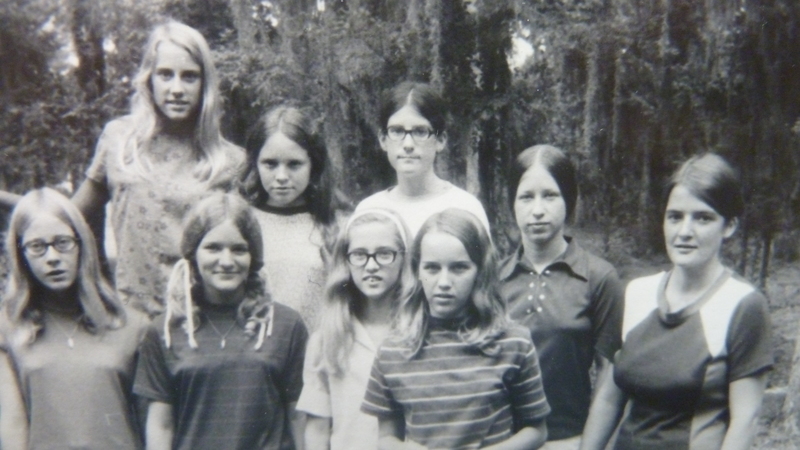 More pigtails and ponytails: me far right as assistant counselor at another Mennonite Camp, Lakewood Retreat, Fla. I will also be pleased to share these experiences through this blog. If you don’t already receive my posts in your email, sign up if interested so you don’t miss it. Beginning THIS FRIDAY Aug. 30, I’m beginning a new “Finding Harmony Recipe” weekly blog feature with a new recipe every week, especially geared to helping families keep family dinner time. More about that in September. And check out the fascinating opportunities available through Road Scholar, where instead of just taking a touristy tour you can LEARN something behind the scenes and meet people if you are at the stage of life (and wallet) when you can enjoy such things. Mandy hopes to be able to offer a similar program again next year at Amigo Centre. A final shout out to a new memoir of Shirley Hershey Showalter’s days of growing up Mennonite called Blush: Mennonite Girl Meets a Glittering World (Herald Press). Shirley is former president of Goshen College. On prepublication 30% discount, $11 until Oct. 22, 2013. Growing up _______. How do you fill in the blank? You don’t have to wait to write a book or give a talk to enjoy putting things into a form your children and grandchildren can enjoy. My mother has loved writing in a book my sister gave her with memory jogs and prompts to write about, like “What was your favorite song when a teenager” or “Your favorite movie,” to which she scoffs, “What movies?” Such as this.